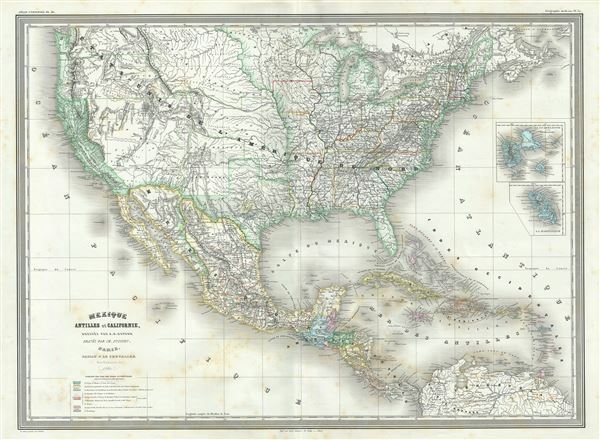 This is a finely detailed large elephant folio 1860 map of the United States and Mexico on Mercator's projection by the French cartographer A. H. Dufour. It covers the entirety of the United States during the brief period following the Gold Rush but before the outbreak of the American Civil War. The European influence of this map can be seen in the French (around San Antonio) and German (near Austin) colonies noted in Texas. Castroville appears as the major town in the 'Col. Francaise,' which extends west to the Frio River. The 'Col. Allemande' shows the Adelsverein's area between the Colorado and Llano Rivers with Fredericksburg as its primary town. An expansive West Texas presents a very wide Panhandle and Trans-Pecos region. Nebraska extends to the Canadian border. Though this map postdates the Gadsden Purchase, the border is shown in the pre-Gadsden configuration. The eastern border of California is curiously defined by the Sierra Nevada range rather than by straight boundary lines. Interestingly, though clearly a map of the United States, California seems to be the focus of this map and is highlighted appropriately in both the map's title and with vivid full color. Most likely this is a reflection of European interest in the Gold Rush. The two inserts are of the French Caribbean island possessions, the remnants of France's once extensive New World Empire. This map was prepared by Auguste-Henri Dufour and engraved by Charles Dyonette for publication plate no. 39 in Armand Le Chevalier's 1860 edition of Atlas Universel, Physique, Historique et Politique de Geographie Ancienne et Moderne.